"Regardless of your political leaning, the great equalizer is that we’ll all become sick one day. At this time of uncertainty about the future of health care, listening to the voice of patients today will illuminate the path forward for all of us." 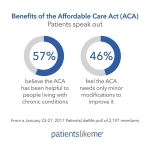 CAMBRIDGE, Mass.--(BUSINESS WIRE)--As Congress and the White House continue to discuss potential changes to the Affordable Care Act (ACA), PatientsLikeMe revealed results from the first large-scale poll to assess patient priorities for the health care law. The poll’s 2,197 respondents are among the estimated 133 million Americans living with chronic conditions. 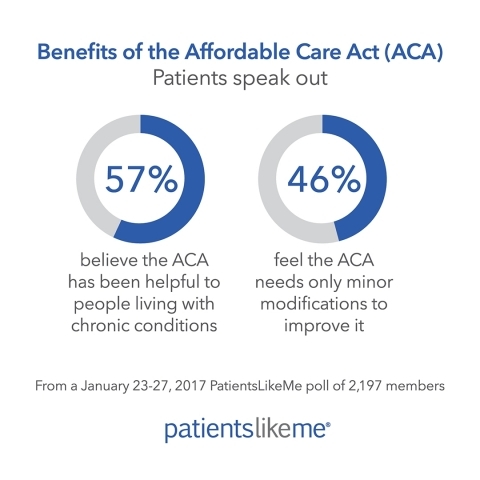 More than half (57%) believe the ACA has been helpful to people living with chronic conditions. 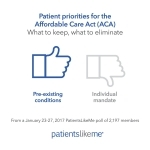 Nearly half (46%) feel the ACA needs only minor modifications to improve it. Over the last year, their out-of-pocket expenses for health care have either stayed the same (47%) or increased (43%). 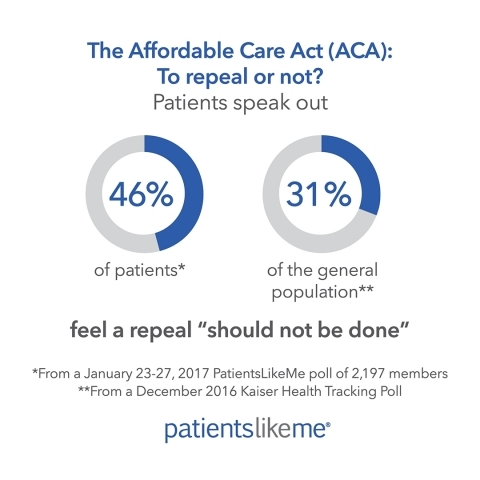 Lowering costs is a priority for both patients in the PatientsLikeMe poll and for the general population, which took part in a December 2016 Kaiser Health Tracking Poll. 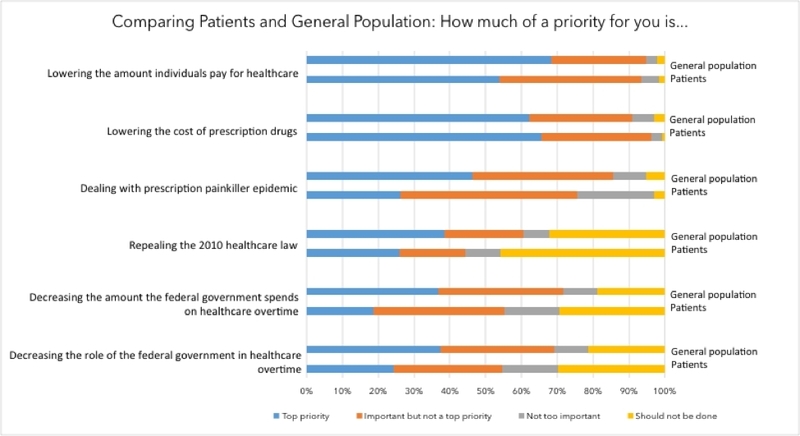 Lowering the amount individuals pay for health care is an important priority for 94% of patients and 93% of the general population. 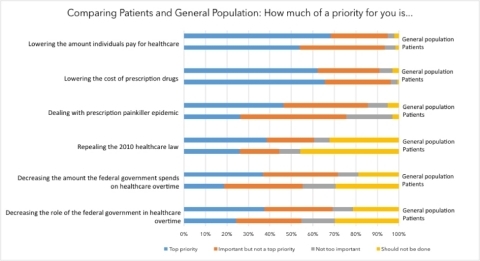 Lowering the cost of prescription drugs is an important priority for 96% of patients and 89% of the general population. 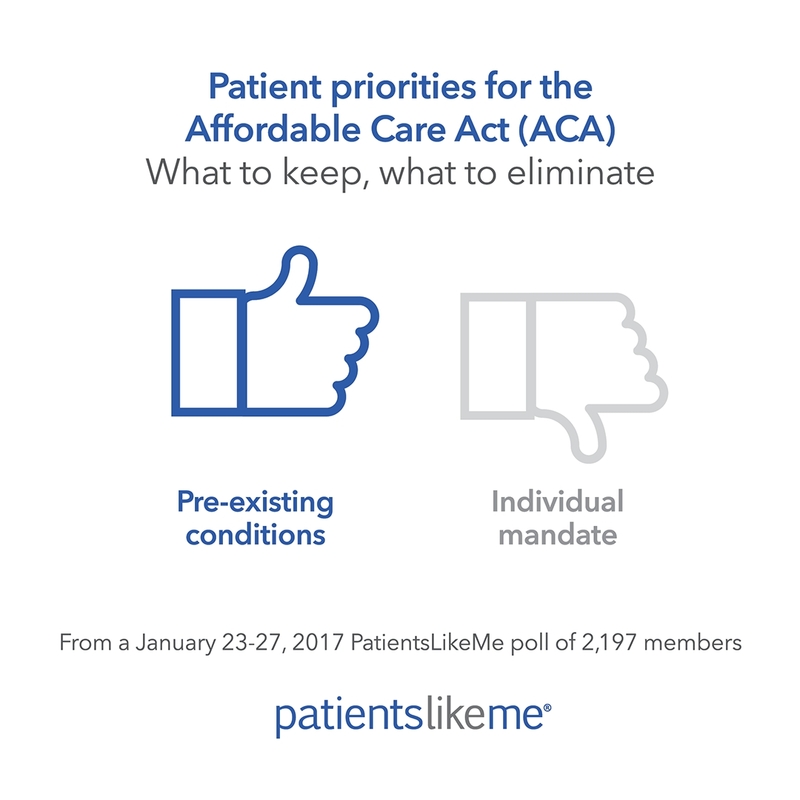 When asked which one component of the ACA they would eliminate if they were forced to choose, PatientsLikeMe respondents were four times more likely to say they would eliminate the individual mandate vs. other components of the ACA. When asked which one component of the ACA they would keep if they were forced to choose, PatientsLikeMe respondents were six times more likely to say they would keep mandatory coverage for pre-existing conditions vs. other components of the ACA. Of those living with MDD, 59% said that the health care law should not be repealed, vs. 45% of the overall PatientsLikeMe respondents and 31% of the Kaiser general population. 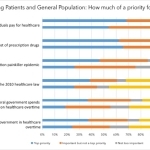 42% of respondents living with MDD said decreasing federal government spending on health care should not be done, vs. 29% of the overall patient population and 18% of the Kaiser general population. 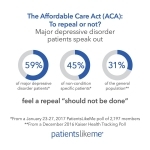 As for reducing the federal government’s role in health care, 37% of patients living with MDD said it should not be done, compared to 28% of the overall patient population and 20% of the Kaiser general population. 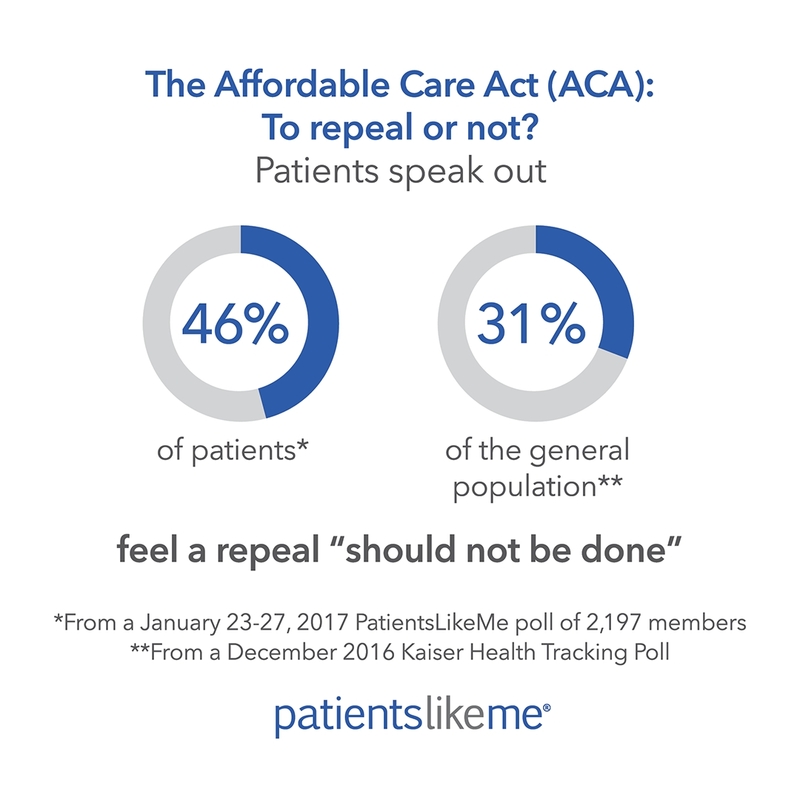 Full survey results and graphics are available at http://news.patientslikeme.com. 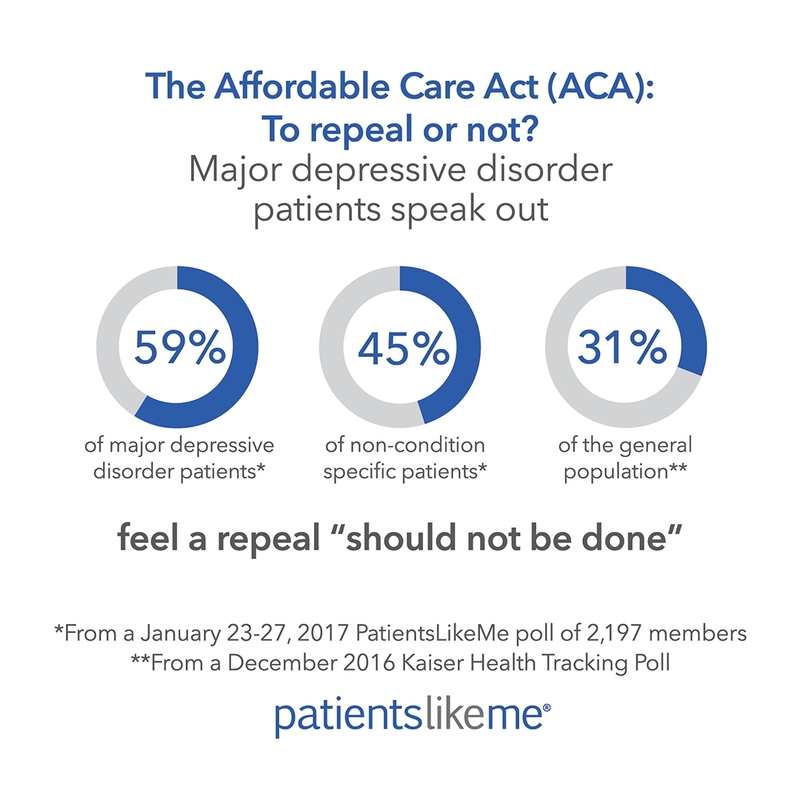 Between January 23-27, 2017, PatientsLikeMe fielded a 19-question poll to a sample of its members in the United States who are living with chronic or progressive degenerative conditions. 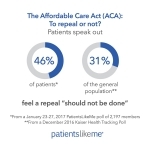 A total of 2,197 patients completed the poll, which asked both original questions and questions from a December 2016 Kaiser Health Tracking Poll to compare patient and general population responses. Respondents had a range of chronic or progressive medical conditions and listed their primary condition as multiple sclerosis (13%), fibromyalgia (12%), Parkinson’s disease (6%), major depressive disorder (5%), ALS (5%), type 2 diabetes (3%) and multiple myeloma (3%), among many other conditions. The mean age of respondents was 54.5 years (the range was 18- >89). Of 1,840 respondents who gave information on level of education (83.8% of total), 1.0% had less than a high school diploma, 11.0% had high school diplomas, 38.3% had some college, 27.7% reported a college degree, and 22% reported post-graduate education. About one-third (36%) of patients had health insurance through their employer, one-third (35%) had Medicare; and the rest had a mix of other health care coverage including Medicaid, VA, military, and direct pay insurance, which includes insurance purchased from ACA exchange programs. A very small percentage (2.5%) of respondents said they had no health insurance. Nearly all respondents (95%) are registered voters. Their party affiliation is as follows: 37% say they are Democrats, 19% are Republicans; 15% are Independent; 13% preferred not to say; 11% are unaffiliated and 4% are Libertarian. PatientsLikeMe, the world’s largest personalized health network, helps people find new options for treatments, connect with others, and take action to improve their outcomes. The company has worked with every major pharmaceutical company and a range of government organizations to bring the patient voice to research, development and public policy. With 500,000 members, PatientsLikeMe is a trusted source for real-world disease information and a clinically robust resource that has published more than 100 research studies. Visit us at www.patientslikeme.com or follow us via our blog, Twitter or Facebook. As you answer the next few questions, reflect back on 2016 and let us know how your experiences changed. How do you think a complete repeal of the Affordable Care Act (also called ACA, or Obamacare) might affect you?